At Just for Jeeps, we know drivers care about quality - they won't buy a flimsy product just because it has a Jeep logo on it. That's why, when we heard customers asking for quality sandals, we had to find a quality sandal that could handle the rugged terrain that Jeep drivers regularly visit. That's why we're thrilled to partner with ISlide, a company that takes sandals seriously. These Jeep men's sandals feature a wavy foam construction that massages the soles of your feel - perfect for helping you relax after a long hike or climb. The outsole has a strong tread you'd find on an athletic shoe. The strap adjusts with hook and loop fasteners and features a super-soft lycra on the interior, so nothing chafes your feet as you walk. And each sandal is sprayed with an antimicrobial spray to protect against sweat and smells. 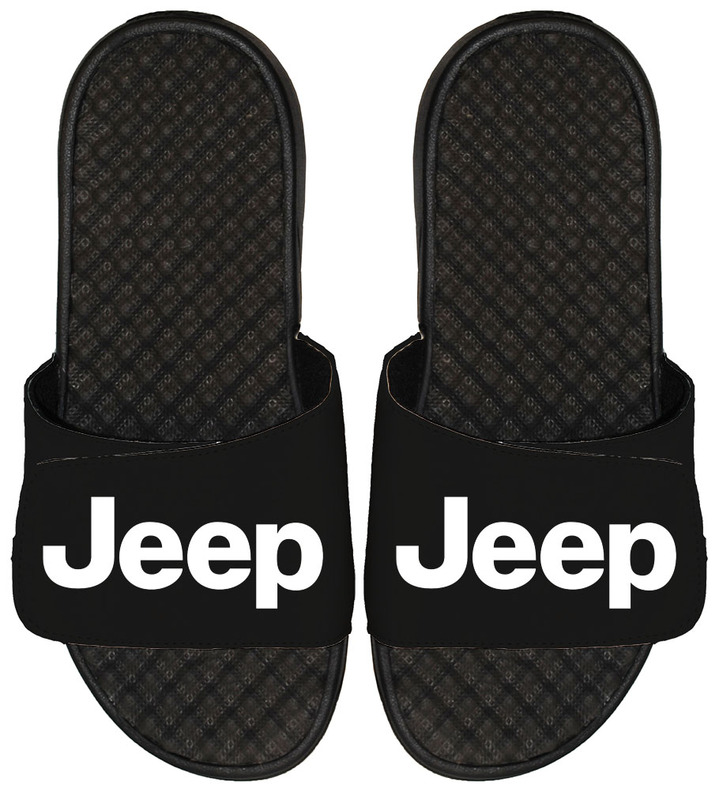 This is a pair of sandals worthy of the large Jeep logo across the strap. Try a pair today and find out how comfy and convenient a quality pair of sandals can be. Massaging Contours - The ripple term is derived from the contours of the footbed lining, that are wave-like and add relief to your feet after a long day in sneakers or shows. Antimicrobial Spray - Every slide is sprayed with an antimicrobial spray after production to protect against sweaty socks and any smells that could arise from wearing sandals out Jeeping. Stability - The midsold is developed with the highest quality EVA for a lightweight yet strong support during every day wear. Comfortability - The super soft lycra leaves your feet with no abrasion. The strap can be adjusted using Velcro so it is always a perfect, smooth fit. Signature Sneaker Outsole - The outsole is sneaker inspired with forefoot and heel herring bone accents.